We are in that sweet spot between summer and fall with everything from peaches to pumpkins available. A farmers’ market paradise! This past week, as I wandered the market making my usual stops for Rachel’s Ginger Beer and Communitea’s Kombucha (though I’m starting to brew kombucha at home ... more on that to come), I was dazzled by the colors and beauty of everything around me. My bag grew heavy as I picked up plums, peaches, tomatoes, blackberries and pears. The rest of my weekend was happily spent making more plum jam, the last peach dumplings of the season, tomato sauce, blackberry crisp and pear studded challah. Oh my! Best of all, I stumbled upon a new discovery: Huckleberries! All of my life I’ve read about them, but given their short growing season I hadn’t yet had the pleasure of eating one of those dark purple berries. They have an intense flavor, but are smaller, firmer and, according to cookbooks I’ve read, more difficult to harvest than blueberries. I had to preserve them somehow before I ended up popping all of them in my mouth! Jam was the way to go. I plopped the huckleberries in a pot and turned on the heat. A splash of maple syrup and some lemon zest and they started cooking. I snipped a bit of thyme and tossed that in, as well, since lemon and thyme pair so well. Bridging the seasons was definitely on my mind, because before I knew it I was chopping an apple to stir in. 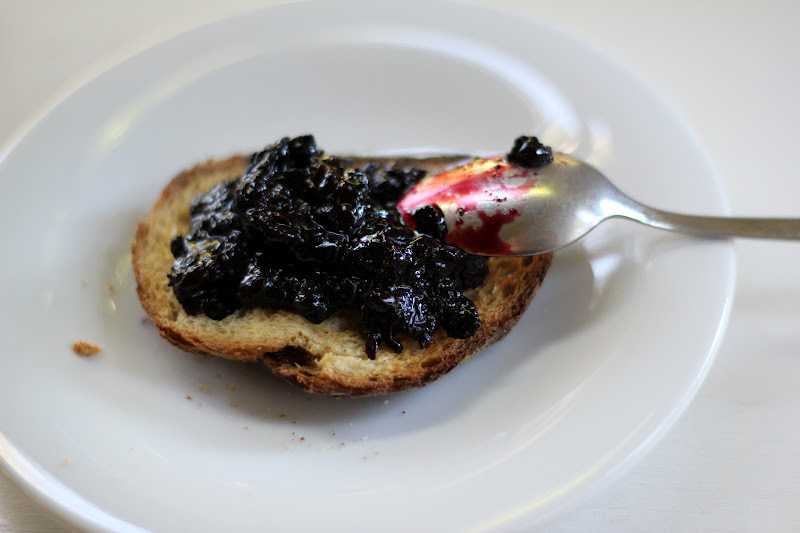 This deep violet jam has a tart, rather wild, taste and is scrumptious. I’m eating it slowly and keeping it slightly hidden in the fridge so I can savor the taste of summer on my toast a bit longer. In a medium-sized saucepan, combine all the ingredients over medium-high heat and stir. 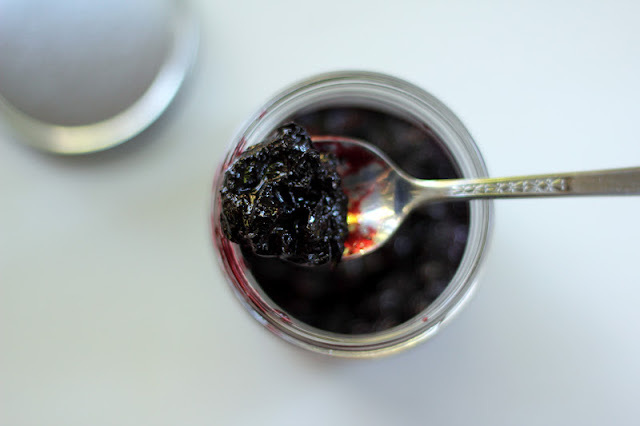 Cook until the berries begin to bubble and soften, about 6-7 minutes. Lower the heat to a simmer and let cook for about 20-25 minutes, until the berries thicken and pieces of apple can be mashed smooth. Stir often to avoid scorching on the bottom of the pan and lower heat if necessary. Remove from heat and let cool. Store in a covered jar in the fridge for up to 1 month. Another jam I must try. I have never had huckleberries. I will try to find some. Really love the thyme addition. I hope you can find some huckleberries, Suzanne - their season is short and sweet, so I'm delighted to have spotted them. Have a great weekend! 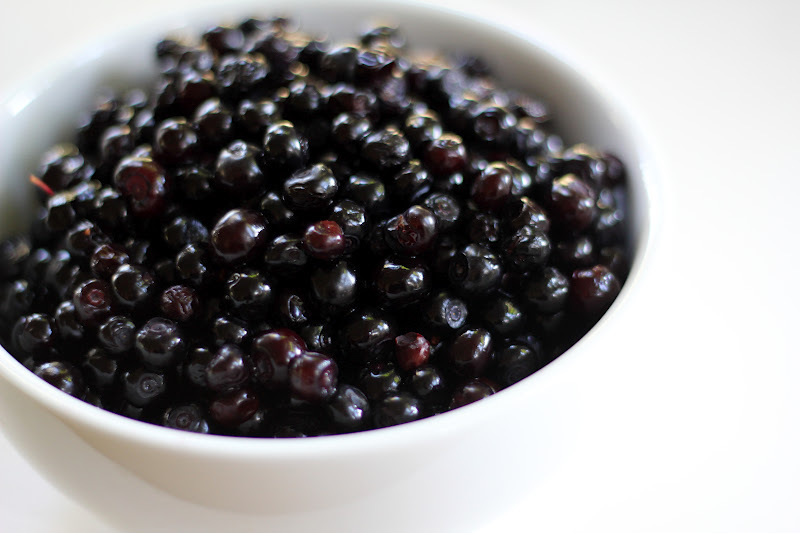 Do you know which variety of huckleberry this is? There are so many here! Do you mind me asking which market you go to? My forager hasn't come to my market this year and I'm having chanterelle withdrawal. I love the thyme in this recipe, btw. Great idea! My guess is Cascade(vaccinium deliciosum). They are absolutely the best ones! I don't think I've ever even eaten a huckleberry! This jam looks so good, though...I may have to seek some out. Thanks, Eileen! I hope you can find some huckleberries - they're worth the search. Enjoy your weekend! I've never had huckleberries, either! I don't think I've ever seen them for sale around here. Adding maple syrup and thyme to jam sounds like a really cool idea. Speaking of really cool, it's definitely a fall day in Kansas. I think we may have finally left our excruciating summer behind. Yippee! Glad to hear you are cooling down, Lauren! You must be looking forward to some delicious fall cooking. I'm thinking of adding maple syrup and thyme to some apple butter. I just read about making fruit butters in a crock pot so you don't have to watch them as closely. Sounds good to me! There were a few scattered huckleberry bushes on the blueberry farm I worked on this summer. It's hard to tell the difference at first sight, but they are wildly different fruits! I would have loved to pick enough for some jam, but I couldn't stop eating them out of hand! I'm envious you had access to huckleberry bushes! What a terrific summer - a blueberry farm sounds idyllic. I'm hoping to get enough huckleberries next year for a pie. My aunt just brought us a bunch of jams and chutneys that she made and I can't wait to try them. I've actually never made my own, but this recipe is giving me inspiration! Oh! This looks wonderful!! I love your addition of the maple syrup and the apple (the latter to help it gel, I'm assuming?). I don't think I've seen huckleberries in our markets, but I'm going to keep an eye out now. Thank you, Susan! Yes, the apple added a little natural pectin which helped the jam set up nicely. I hope you can spot some huckleberries - they are quite delicious! What a wonderful jam flavor! I've never tried huckleberries but I'm sure I'd love them! I'm sure you would, Laura! Hopefully you come across some - I'm sure you'd bake a beautiful and delicious treat with them! Oh Hannah, this jam looks so yummy! I agree about the "sweet spot" between the seasons. This is a wonderful time of year to cook and eat! Thank you, Karen! Isn't this a fun time to be the kitchen? There's so much to enjoy. I can't wait to see what you're cooking up for fall! You are so right, Mairi, huckleberry really does have a nostalgic feel! Sugar plum is another one for me. I had a doll I named Sugar Plum when I was little. Hopefully I'll discover the real thing someday!